Is Enslaved racist? About as much as Resident Evil 5. African American-focused NBC news website Grio has posted an opinion piece on Ninja Theory's Enslaved that questions its racial sensitivity. Columnist Kyle Harvey sees the game as "irresponsible" and believes that it has "racial undertones." Harvey's argument is based on the fact that Enslaved involves a character named Monkey that is forced to do another character's bidding. "I'm saying Enslaved is a culturally irresponsible game," he writes. "Based in the not-so-distant future, you play as a slave. A slave named Monkey." Forget the fact that the main character's name stems from Enslaved's loose basis on Chinese novel Journey to the West. 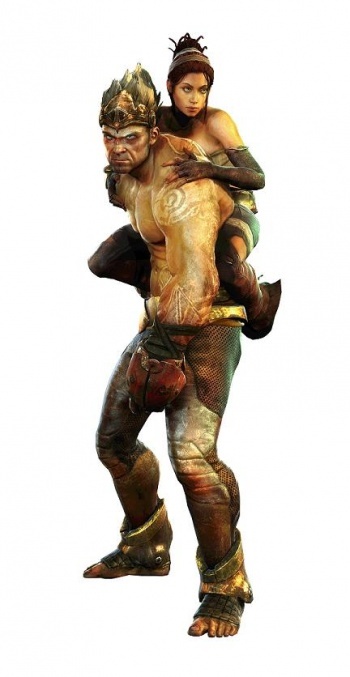 Enslaved begins with Monkey and a female character, whom have no previous relation to each other, escaping from a crashed ship. The female "enslaves" Monkey with a piece of technology to ensure that he won't harm her and to make him do her bidding. Harvey compares Enslaved's plot to that of an "excerpt from a slave diary" and says the "premise alone raises enough eyebrows to warrant a serious debate." He says this relationship reminds him "more of the Driving Miss Daisy variety than Lethal Weapon." Forget any possibility that the game was set up this way for the purpose of challenging gameplay and to create conflict within an interesting story. Harvey admits that Monkey is not "decisively black" and says he has an "olive" or "tan complexion," but he wonders "if this game would be on the shelves if the main character's skin were a few shades darker." If anything in Harvey's article rings true, it'd be this, but he's reaching by even calling Monkey all that tan. The article goes on to say that Enslaved is about earning "freedom papers," that "having a slave essentially fight for his basic rights to humanity as the plot of your story is more hurtful than inspirational," and that the game "shouldn't even exist." Much like my thoughts on the racial controversy that surrounded Resident Evil 5 last year, Harvey's claims are the result of looking for something that isn't there. Racism exists, and it's one of the worst parts of life, but there's such a thing as oversensitivity too. Resident Evil 5 was no more racist towards African Americans than Resident Evil 4 was to Caucasians, and Enslaved isn't racist just because its primary gameplay mechanic involves a futuristic control device.